Makha Bucha takes place on the full moon of the third lunar month. The day commemorates two separate events that occurred on the same date, but 45 years apart during the lifetime of the Buddha over 2500 years ago. The first event was the spontaneous coming togeather of 1,250 monks to meet and be ordained by the Buddha, woithout any prior announcement having being given. This took place 7 months after the Buddha began his teachings. The second event, which took place 45 years later, was the Buddha delivering his teachings shortly before his death. The name of the event is derived from two words in the Buddhist Pali language: "Makha" which is the word for the third lunar month and "Bucha" which means to venerate or to honour. Thus Makha Bucha Day is for the veneration of Buddha and his teachings on the full moon day of the third lunar month. 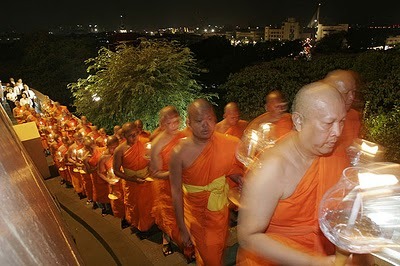 Makha Bucha Day is a very important Buddhist Holiday in Thailand (where about 92% of the population are Buddhist). Many Thai people take the day off work, but the main festivities take place in the early evening. Thai Buddhists gather at the temples at sunset to "Wian Tian". Wian Tian is the act circumnavigating the Bhot (the main building of a temple complex), where Monks are ordained, three times. While doing this they chant and carry with them one burning candle and three incense sticks held along with one lotus flower between their upright folded hands. They do this as a way to show their respect to what is called the "Tripple Gem", which is the Buddha himself, his teachings and doctrines, and the monkhood he founded. 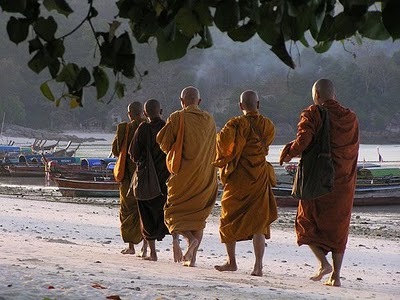 As such, the first time they walk around the Bhot they think of the Buddha, on the second they think of his teachings and the third, they think of the monks who devote themselves to Buddhism.